Since getting her new EOS 1100D Marli's been trying out various things to learn how to properly use a DSLR camera. The kendo practice that Martijn and I do on a weekly basis is one of her favoured test subjects since it involves fast moving subjects. The added bonus is that many of her photographs can be used as a study-aid by myself! The photograph shows how fscking grey my hair is getting. 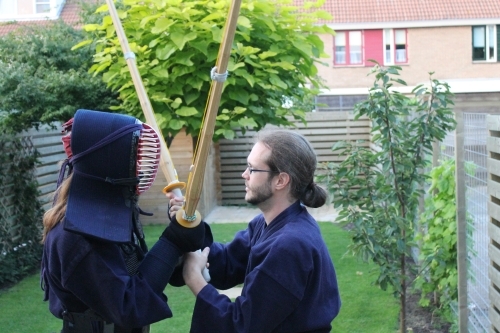 "In this way, even though we note the success of modern kendo, we must deeply consider and reflect on what its become. One example is the case where we have banned tsuki for use in children of junior high school age and below; to look at it a different way, if you consider the very basis of kendo – hitting a clear DATOTSU (打突) i.e. cutting (打) and thrusting (突) – we have removed the thrusting part (突) and as such its not an exaggeration to say what we are left with is a kendo that incomplete (deformed)." It had never occured to me that the is litterally "da to tsu"! Hence the "Aha Erlebnis", because the kanji for the word are indeed "da" and "tsu" the "to" being implied". Tsuki not with your hands, but with your hips (correct body movement);"